Lightspeed Proto is a full service Electronic Manufacturing Services (EMS) company providing turnkey assembly services. Lightspeed Proto provides full or partial turn-key assembly of Printed Circuit Board Assemblies, electronic & electromechanical devices. 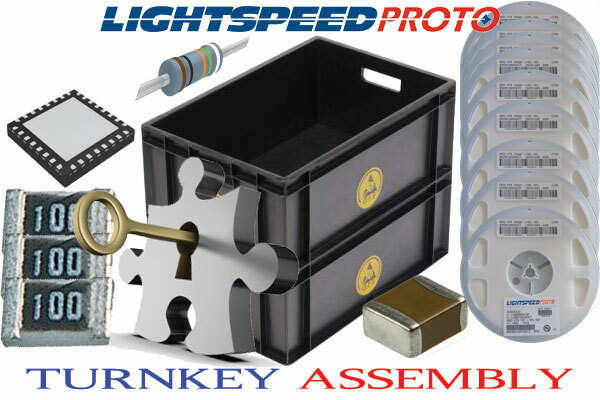 Lightspeed Proto will order all the components & the materials for your turnkey assembly from your (BOM) Bill of Materials. Assembly's turnkey material & components are systematically managed throughout the process for an uninterrupted manufacturing flow at our factory. Bill of Materials (BOM): A completed BOM including the circuit board and all components preferably in a Microsoft Excel format. BOM should include: Manufacturer’s Part number, Manufacture’s Name, Reference Designator, Description, and footprint. Please also include your “Do Not Populate” list, for any parts we will not be placing. PWB Gerber’s: The complete package of Gerber files generated by your CAD program for PWB fabrication. Centroid data: X-Y, Pick and place machine data. Top Side and bottom side with Reference Designators. Assembly Drawings: Showing all Reference-Designators and including all Pin 1 locations. Don’t forget to include any special assembly procedures, ECO’s etc.. Note: There is a $550 minimum order on materials for a Turn-Key order.